RPG TITLES » Star Citizen » Star Citizen: Physical Goods Available! 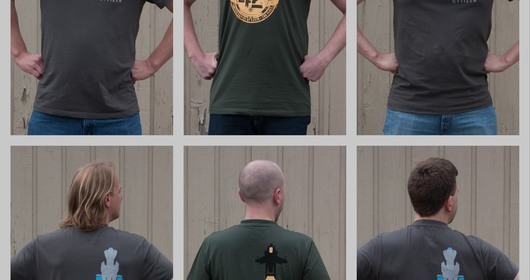 Did you miss your chance to get a Star Citizen t-shirt or patch set? We’re happy to announce that we’ve put the remaining stock of our first run of both items back in the store. Star Citizen and Squadron 42 shirts plus all five types of cloth patches are available for purchase now. Don’t delay, though: stock is limited to what was left over from the original production run and when they’re gone, they’re gone! In the longer term, we’ve been working behind the scenes to establish a system for manufacturing and then shipping physical goods on demand; in the future, we won’t need to wait to do production runs of goods like these; you’ll be able to order Star Citizen merchandise from the site once it’s ready to ship to you. Star Citizen: Physical Items Available for a Limited Time! Star Citizen: MISC Starfarer Now Available! Tagged Available, Citizen, Goods, physical, ‘Star.